EdgeSafe PST2PST Backup software is a unique incremental PST backup solution to seamlessly and incrementally backup Outlook's PST files; providing a managed backup solution for PST files that are located on the users' notebook or desktop onto a central storage area. EdgeSafe PST2PST Backup has the ability to backup PST files that are located on the users' workstations even if Outlook is open. ...... Since the backup is incremental, it can happen even while the user is working and since it is very light in resource usage, the user barely notices when the backup is running. 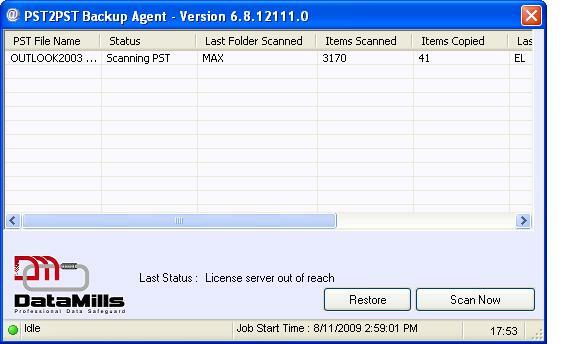 Every predefined period, EdgeSafe PST2PST Backup Agent simply checks if the backup destination is available. Then it copies any email item that had been created/modified after the last backup run into a secure, per user backup folder, which is located on a central backup/archive location. A quick and easy to use backup tool. Backup your data using RAR file format. Qweas is providing links to EdgeSafe PST2PST Backup 7.1 as a courtesy, and makes no representations regarding EdgeSafe PST2PST Backup or any other applications or any information related thereto. Any questions, complaints or claims regarding this application EdgeSafe PST2PST Backup 7.1 must be directed to the appropriate software vendor. You may click the publisher link of EdgeSafe PST2PST Backup on the top of this page to get more details about the vendor.